I have a wall of windows (and one door) that I need to cover but the door is causing an big headache. I just don’t know how to cover or if to cover. See I have a symmetry affliction. If it does not have some symmetry, it will bother me. So how would you cover the three windows and the one door so that it looks symmetrical? Or should it even be symmetrical? I definitely think that the main wall with the fireplace and television needs to be perfectly symmetrical, and it also needs to be the most eye-catching since it is the focal wall. With all of the hard surfaces, it needs softness, so draperies would be the most appropriate. On the other window and the door, there’s simply no way to maintain perfect symmetry, but I actually don’t think that’s important. I would recommend dressing them similarly, but not necessarily identically. On the windows on the main focal wall, I would use full-length draperies hung high close to the crown moulding. Then on the third window, I would use a Roman shade in the same fabric. On the door, I would use either a smaller Roman shade or a small valance. So what advice to you have for Jennifer? 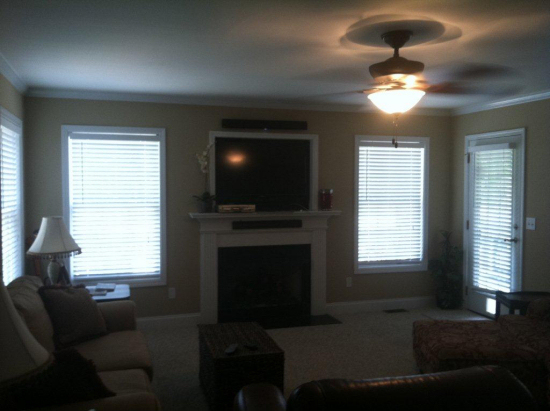 What window treatments do you think would work best in her family room? Give her your two cents!! I love your solution to this window dilemma! I like the solution idea but it looks like this could really take away light in the room because the drapes cover quite a bit of the window because they are so heavy. Maybe there is an option for drapes that let light through but still give the effect, or perhaps extending them out on the wall so it leaves the entire window open? Maybe that is what you intended and the picture didn’t quite convey it. But I do love the roman shades to make it all even! I think your solution is a good solution. I personally love roman shades! I would bring the curtains as close to the ceiling as possible, including the side window and the door BUT bring the rod wide enough out to just frame the windows and door. By doing this, there is more hieght (or illusion of) and bring the width out opens the windows and doors as to bring in as much light as possible. I love this idea Lori!! I think your solution is perfect. The room has so many windows and a door that even if you used heavy drapes the light could still get through. I would use a cranberry colored drape with maybe a light pattern to add interest. The roman shades are a great idea. If that door is going out to a deck a screened door would be a great option to let light in and have an outdoor view as well. 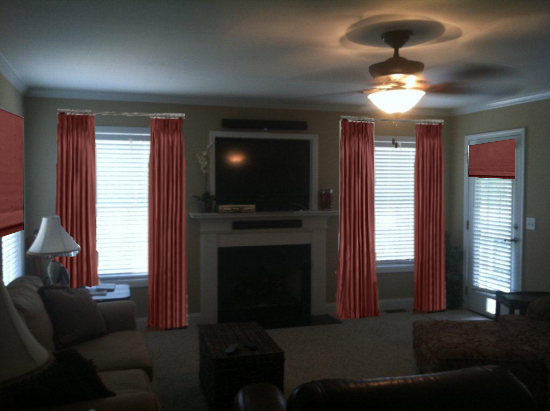 All curtains should have the same treatment and the door should be simple and not attention grabbing. I would find it odd to not have all the windows in the same room match. Being assemetrical is fine… it will actually make your space look better… the layout of the furniture is key, not the window situation. Well, I love the style of the curtains on the 2 windows, but hopefully no tht color. I would leave the door without a curtain since it pulls your eyes away from the symetrical windows. I might also instead of a solid color put a pattern since everything in the room is solid color. Maybe a geometric pattern, but large, like big squares…browns, tans, black or very colorful….like circles in blue, orange and green:) I know…a little out there…oh, some throw pillow in a similiar pattern but smaller.. I like the way your drawing balances the door (which looks awkward in the corner) by tying it to the other window across the room. I think this will deemphasis those two window and let the focal point wall shine as you said. I wondered is she going to keep those blinds for privacy? Does the couch block panels? It would be pretty to take down the existing blinds and hang rolling fabric shades on the door something with a detail at the bottom like a iron bar. On the windows hang the rolling shades with the same bottom detail. Hang them near the ceiling for height and to unite all the windows. Then hang panels on all the windows. Lower the shade stopping right where the light breaks through the window for daytime. I would love to see a large scale geometric for the shade and a solid for the panels too. I love that look. It is so dramatic when the shades are down. But either way will be gorgeous. I would dress all the windows the same with floor to ceiling drapes and in a lighter more airy fabric to not hide the light. For the door I would do a roman shade in the same fabric. The most important part is the focal wall and you want to draw attention to it more than the door. Good suggestion! I would probably opt to leave the door without the fabric dressing. Could also just hang one panel to the outside of each window. Hung high also and maybe a soft tie back. I would move the curtain rails and put longer ones in. This means that when the curtains are open, they could rest against the walls and not be infront of the windows. This way, in the daytime they’ll be just ‘window dressing’ and not actually black-out curtains. I don’t understand why a room with so many windows are so dark. I have a second option which may go very well in this room. It involves using lighter curtains (like net curtains) and forming a sort of semi circle (to balance out all the square shapes in the room – there are just too many). I’m sorry about this, but I have no other way of showing you what I mean without showing you this picture on my blog. Sorry about the link. http://ourdiyprojects.net/dining-room-make-over/ The 6th picture on this page with the red chairs show you what I’m talking about. 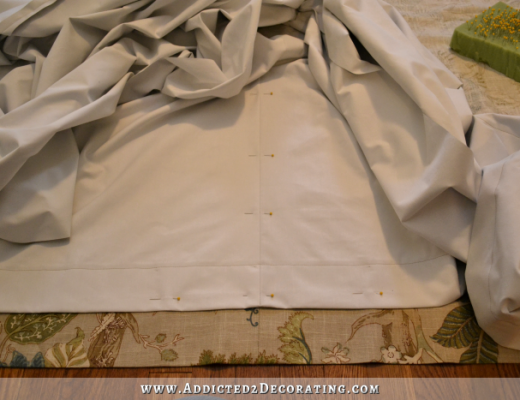 I used 2 curtain rods – one at the below and one at the top to create this look. Then I rounded the curtains so they fold in a circular way over each other. Hope this helps. Ask me if you need any more explanation. I think this space is crying out for some colour and pattern. I also love symmetry in a room and would hang drapes on all the windows as well as the door. Hang them as high as you can, and about 10″ past the side of the opening, so that no light is blocked when they are open. I can’t tell if the side window is full length, but treat it as if it is- hang with floor length drapes and move the couch forward about 10 inches. Use a large graphic print to add interest to the space and add some coordinating pillows to the furniture. I love what curtains do for this room! It softens it and adds elegance. The only thing I don’t like are the window coverings on the door. I think a cool option would be frosted glass (etched or a window film or something), and no extra coverings. There’s my 1 cent. Haha. Really nice touch! For more light though I think I’d elongate the rods over each of the two windows on the focal point wall AND only use one set of drapes — hanging one panel to the side of each window. Make sense? Or simply use white drapes to reflect light into the room. Good job! I have work with a window treatment company before. Make sure of its safety to kids and the color blend to your home. Window are just like our doors. 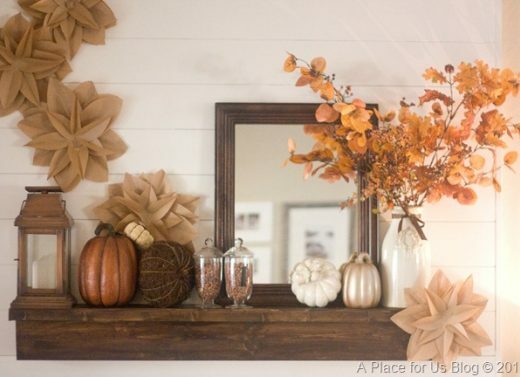 Proper decoration would make it very pleasant to our eyes.